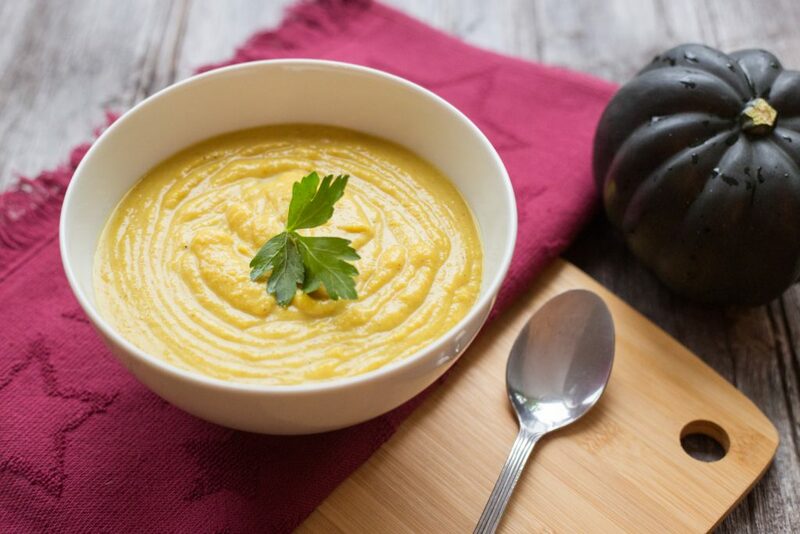 The inspiration for this soup came from wishing to use up some vegetables that we had on-hand….hence the inclusion of one small – and I mean very small – carrot! We also had a rather packed schedule for the day, and I wanted something nutritious, warm and yummy. I’m also a big fan of taking advantage of seasonal foods. I believe it’s what our body needs on a cellular level, it’s often economical, and it’s often much more environmentally friendly. Exotic foods are lovely, but the carbon footprint is pretty large to rely so heavily on imported foods. We are using our Instant Pot for making soups now, and we really love it. We use it to sauté veggies prior to converting it over to “slow cooker” mode. We appreciate this feature because it means one less pan to clean, which is a pretty big deal for us, and we love coming home to the aroma of homemade soup! Of course, you could make this without a slow cooker, just using your stockpot. One quick product note: we recently brought in a wonderful turmeric paste from Truly Turmeric. The variety we brought in is blended with black pepper. Black pepper enhances the absorption of the anti-inflammatory property in turmeric called curcumin. I love this paste because it’s so fresh, comes in a glass (not plastic) reusable jar, AND I don’t look like a chain smoker because it isn’t as messy/finicky/fingernail staining as grating turmeric root (call me a princess…). This paste is super delicious when blended with warm almond milk with a dash (or dollop) of honey/maple syrup! Cut acorn squash in half and remove seeds. Lightly brush with olive or avocado oil and season with salt and pepper. Place cut-side down on parchment-lined baking sheet. Roast at 400 degrees for 30-40 minutes. For final 10 minutes, flip squash over. Once cooked through and tender, remove from oven and let sit to cool a bit before scooping out flesh. In a stock pot or Instant Pot, sauté onion and garlic in coconut (or other) oil. Add chopped carrot (if using), cumin, coriander, salt and turmeric paste. Once onion has softened, add squash, broth and maple syrup. Simmer for 30 minutes if using stockpot, or set on low with slow cooker for several hours. Prior to serving, add can of full fat coconut milk and blend using an immersion blender. Enjoy!